Birmingham City have signed Sunderland winger Will Buckley on an initial month's loan. The 26-year-old ex-Rochdale, Watford and Brighton player moves to Blues with a view to a more permanent deal, once he has proved his fitness. Buckley is a replacement for Demarai Gray, who joined Premier League side Leicester City for £3.75m last week. But Blues look like having to face the rest of the season without injury-plagued full-back Neil Eardley. Eardley, 27, who is out of contract at the end of the season, may have to undergo surgery on a cruciate knee ligament injury, less than a month after coming back from a shoulder injury. "He's had a scan and it looks like a cruciate injury," Birmingham boss Gary Rowett told BBC WM. "I don't know the exact prognosis but I would hazard a guess it would be the season and a little bit more. He's very low. He's been incredibly unlucky with injuries and our hearts go out to him." Buckley began his career at Rochdale before moving to Watford in January 2010. He signed for Brighton for £1m in June 2011 before following his old Seagulls boss Gus Poyet to Sunderland for £2.5m in August 2014. But he has not figured this season and spent a month out on loan at Leeds in October, making his debut in a 2-0 home defeat by Blues. 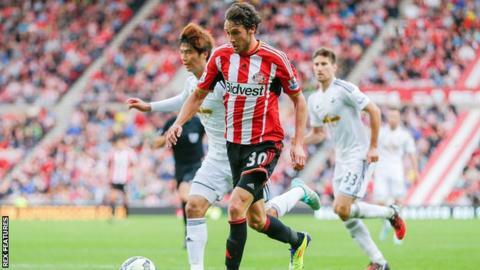 "Things perhaps haven't quite gone for Will Buckley in the last year at Sunderland," said Rowett. "But I look at what the potential is in any signing. "When he played at Brighton, he was perfect for a counterattacking system, He's very athletic, good pace, two footed, travels well with the ball and has that little bit of Premier League quality in the final third. "If we can get that out of him and have him enjoying his football again, I think we'll have a really top signing on our hands." He is Blues' second signing of the January transfer window following the extension of Huddersfield Town striker James Vaughan's loan until the end of the season. Buckley is expected to figure in Saturday's trip to Derby County for a Blues side who are back up to eighth in the Championship, having now picked up seven points out of nine since losing 3-0 at Sheffield Wednesday on Boxing Day. "I'm pleased with how we've responded," said Rowett. "This division is all about navigating little blips. "It is a challenge. You just stay level headed, focused and don't panic."